With all the heart-ache happening in the Pale of Settlement with pogroms against Jews, a return to the land became a movement for Jews with the desire to revive Jewish national life. The Jews who never left the land were called the Yishuv and they started the movement. They knew that the Jews in the Pale of Settlement belonged in their ancient land with them. The Pale was land owned by Russia where Jews were allowed to live. Jews couldn't come into Russia proper, only live in the Pale. The Pale consisted of Latvia, Lithuania, Poland, Ukraine and Belarus. In 1860, Jews built the first neighborhood or quarter outside the walls of the Old City of Jerusalem. There were 2 Hebrew periodicals regularly published in Jerusalem, both calling for a return to the Land. In 1870, the first Jewish agricultural college was established in Mikveh Israel which is today on the outskirts of Tel Aviv. In 1878, Jews from Jerusalem founded the first new village in the land-Petah Tikva which today is a town of over 85,000 and only 10 miles from Tel Aviv. Other villages were founded near Jerusalem and in the Galilee. " It was founded in 1878, mainly by religious orthodox Jews, also known as the Old Yishuv, and became a permanent settlement in 1883 with the financial help of Baron Edmond de Rothschild. According to the Central Bureau of Statistics, at the end of 2009, the city's population stood at 209,600. The population density is approximately 5,800 inhabitants per square kilometre (15,000 /sq mi). Petah Tikva's jurisdiction covers 35,868 dunams. 1921, Rabbi Stampfer is the son and grandson of rabbis and pioneers. His paternal great-grandfather and namesake, Yehoshua Stampfer, was a founder of Petach Tikva, the first modern Zionist settlement in what is now Israel. His maternal grandfather, Rabbi Tzvi Pesach Frank, was for several decades the Chief Rabbi of Jerusalem. Rabbi Abraham Isaac Kook, the Chief Rabbi of Israel and a close friend of Rabbi Frank, served as Stampfer's sandek or holder at his brit milah. In 1881 and following years, Jewish immigrants who belonged to the Hibbat Zion (Love of Zion) movement arrived in Israel from Eastern Europe. This was called the First Aliyah-going up spiritually of living in Israel. Some joined existing villages, others founded new ones. Some of the villages established during the last 2 decades of the century are large towns today like Hadera and Rishon Le-Zion. The living for these pioneers was harsh. The population was small and dispersed. Communication was poor. The Land was in a state of neglect with swamps, and malaria was the rule. The Ottoman Empire administration was hostile and oppressive towards Arabs and Jews. It can be compared to life of pioneers in the USA at that period. Knowing the struggles these people went through to create the state of Israel makes today's population most appreciative. By the end of WWI in 1917, the Ottoman Empire lost their hold on the land. One would never think that after having been accepted that Jews were to have a Jewish Homeland from the land of Palestine, land lost by the Ottoman Empire because they sided with Germany in WWI and actually the former empire of Israel and Judah, that there would be no problem. It was decided by the League of Nations that it was to be and Britain was given the responsibility to bring it about in the form of the mandate. One would never think there would be any doubts about it after the the United Nations voted it in as a state on May 14, 1948-a double legal entry that Israel was a legal Jewish state. Here we are, again defending our right to be called a Jewish state. Who's having a fit about it? The Palestinian Arabs who want it for themselves-at least to start with their own state out of land belonging to Israel right smack alongside and inside of Israel in east Jerusalem, which they want as their capital. David's capital. Jerusalem. King David who created it for Israel. King David who lived from 1010 BCE to 970 BCE, 3,000 years ago. When Sharon was Prime Minister of Israel, the US. government put enormous pressure on him to "do something," and he did. He decided to move Israeli citizens out of Gaza for the sake of peace. He also moved villages and towns out of Samaria. Now there are two counties if you wish, Judea and Samaria. Samaria is the northern one. Jews call them by this established name. Americans journalists and others call them the West Bank, a name from Jordan grabbing them as they were land west of the Jordan River. Jordan had grabbed them in 1948 when the fledgling Israel state was busy fighting off all their neighbors who had declared war on them 15 minutes after their declaration of being a state. Sharon did this in the hopes and half-promises and innuendos of the USA that this might lead to an end of the bloody Arab/Israeli conflict. Even Sharon's own Likud party overwhelmingly rejected the plan. This is because Gaza did not belong to its mostly Arab inhabitants. Gaza had been a province of the Ottoman Empire and became part of the British Mandate of Palestine. In 1947, the UN proposed to partition Palestine into 2 states, one Jewish and the other Arab. The Jews, seeing it amounted to only 20% of the original piece of promised land to them for a Jewish Homeland, decided it was better than nothing and accepted the offer. The Arabs rejected the offer. Fifteen minutes after the announcement of Israel being a state, 5 Arab armies invaded Israel. Israel wasn't the mighty army based country it is today. It was a ragtag group of Holocaust survivors, tired groups that had been fighting for survival already, and hopeful people who had waited 2,000 years for such a moment, for they had been praying every day for this return. It was a huge miracle that they defeated the combined Arab might. After this war, though, Jordan still had control of Judea and Samaria and east Jerusalem and Egypt stayed in control of the Gaza Strip. They held it until the 1967 Six Day War when another huge miracle happened; Israel won that one, too, against all odds. This miracle gave Israel back all they had previously lost, including the Gaza Strip. Now Israel made every effort to improve life of the Gazans and give them decent housing and infrastructure. The Arabs only pouted and rebuffed all the efforts of the Jews of improvement. The Arabs wanted to keep the Gazans in miserable "refugee camps". They have been there, festering in squalor for over 50 years and dreaming of vengeance against Israel. They've learned no skills, and have not improved their minds except to learn to built rockets against Israel and to build tunnels to bring in contraband- things used as ammunition against the Jews. This was the worst plan imaginable-to vacate Gaza. 7,500 Jews left in the name of peace and many still haven't been able to regain their lives that they had. It set a precedent, that to make the Arabs happy, they had to have land that was Judenrein-free of Jews-something invented by the Nazis. It rewarded terror and was viewed by the Arabs as a sign of weakness. They would be free to import arms through their port and airport. What this did was to exacerbate the problem. That the Jews abandoned their homes and businesses was seen as a victory for terrorism. The Israeli military left and this was seen as the chance for terror to increase and violence would explode and drive all Jews out. by raining down rockets, missiles and mortars. They saw this as causing thousands of Jewish deaths and Israel would be defenseless. What have the Jews gained in return for their efforts towards peace? The raining down of rockets, missiles and mortars, air raid sirens and many portable bomb shelters. Besides that, they now have Kerry saying that it's a mistake to expect the Arabs to accept Israel as a Jewish state. No-they'd much rather call it an Arab state-no doubt. One idea that came up in 2004 proposed in the Forward newspaper was that if all Jews were moved out of Gaza, and Judea and Samaria, which the Arabs want to use for their Palestine, evacuate all Arab from Israel and resettle them in Gaza, the West Bank, or wherever they might want to go. It would be an exchange of populations. It's happened before on the Indian subcontinent. Of course it caused a lot of bloodshed, but is a good example of a population exchange. Well, this population exchange didn't happen. Of course, Arabs who were working and living already in Israel proper certainly didn't want to move and they were not the problems. We have Hamas terrorists who have taken over Gaza and have turned everyone into worse terrorists. Fatah won't recognize a Jewish Israel. Could we then say we shouldn't have recognized a Muslim Arab state? Sharon did, though. Can we say we were just kidding? 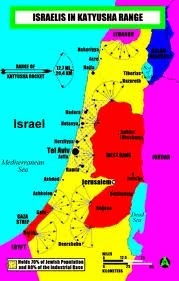 There was a province of Palestine, called that in 135 CE by the Romans who had taken Jerusalem in 70 CE. There was Bar Kokhba who fought against them for 3 years from 132 to 135, but they finally lost against this massive army, but really gave them a headache in doing it, for it was a ragtag Jewish army that fought harder than any other had against the Romans. That's why the Romans named the land "Palestine" after an enemy group of the Jews. Arabs lived in Syria as well as all the surrounding countryside. They called the province Syria, though. The Arabs of today are descendants of the Arabs who came to the Jews looking for work as their countries didn't have jobs. Very few Arabs actually owned land in Palestine. Those who did sold their weed infested dried or swampy mosquito-filled land to the interested Jews who paid their high prices. Now that the Jews have made a modern miracle out of the land, the Palestinians are chomping at the bit to take it over. One self-important personage, Abbas Zaki, a senior PA official of the Central Committee, is bragging that now that the Jews are in one place it will be easier to kill them all. "Zaki currently serves as Palestinian leader Mahmoud Abbas’ commissioner for dialogue with the Arab world and China. Earlier, "In response to United States president Barack Obama's U.N. Speech on Palestinian Statehood on September 23, 2011, Zaki called Obama and Benjamin Netanyahu "trash", and said "The greater goal cannot be accomplished in one go.... If Israel withdraws from Jerusalem, evacuates the 650,000 settlers, and dismantles the wall – what will become of Israel? It will come to an end." It sounds like that's what his goal is, to bring Israel to an end now. We see his idea is including the dismantling of the wall because that is in east Jerusalem. Forward, July 9, 2005, page 3. , Abandoning Gaza, would Israel's withdrawal from Gaza lead to peace?